Sopes are traditionally a thicker version of a tortilla cooked on a comal, a Mexican flat cast iron pan of sorts. I ate a sope, here in Vancouver at a food truck called, El Grullo, located in the Gateway Produce parking lot. The genius little Mexican lady cooked hers in a cast iron pan with some oil in it, to par fry it instead of just cooking it on a comal. So that is what I did, and it is so good! I have mentioned before to you all that you may find an abundance of Mexican and Spanish influence in my recipes. This is no joke one of my favorites, I say this lightly I suppose, because really all Mexican foods are my favorite. I do love all foods a lot, but Mexican food, the real Mexican food I will swim in, eat all, use as hair dressing, I do not care, it is good and I want to eat it seriously. I sound like I am joking but I am not. Whenever I am craving something, it is usually a taco. A street taco at that, or a carne asada plate, which I can make into a taco, it really does not matter, again, I will eat it. I LOVE IT! As for these, it is no different. 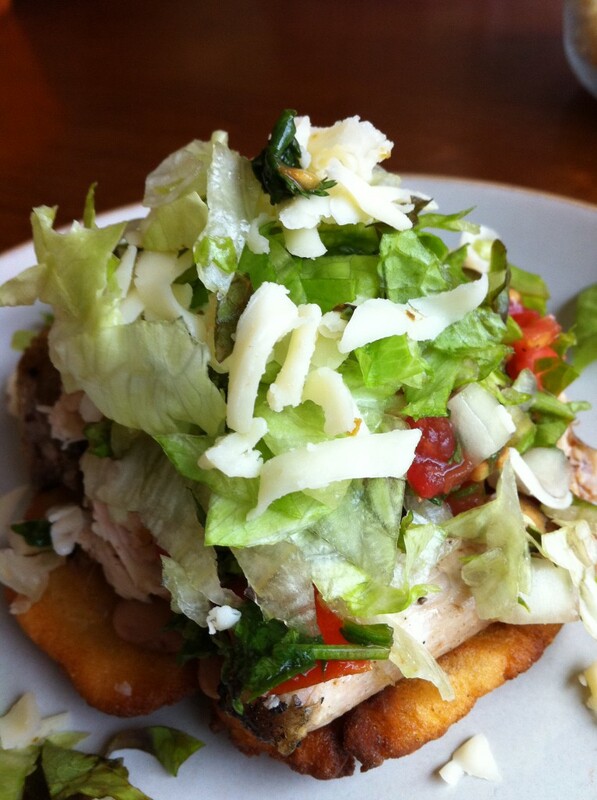 Sopes, pronounced… so-pez, are amazing delightful little treats. They are easy to make with a little prep, and you can use any meat you like, or no meat at all. That is not sac-relig, to each their own. You can make each of the ingredients days ahead, or all on the same day, it just depends on how much time you have got on your hands. I made each of these separate items on a cool Sunday morning, and our house smelled like a Mexican street filled with little Mexican food goodies, or someones house. Wherever you imagination wants to take you for the ride, that is up to you, I went to Mexico this morning, and it was fabulous! This is my version, this time. And check the recipes I have, they are all there for this complete recipe. Just substitute wherever you like. Each individual recipe is enough for this whole recipe. You can purchase harina masa at pretty much any grocer nowadays, but I get mine at the Mexican markets. 1. Prepare your masa by following the instruction on the back of the bag. I say this because my harina may be different than you harina. I made enough for 8 sopes. 2. Take a piece of masa a little bigger than the size of a golf ball, and flatten it to 1/4 inch in the palm of your hand. Repeat until you have used all of your dough. You can choose to do the next step, or not, it is up to you. Place the flattened golf ball on the counter and take a 1/3 cup measuring cup to make a divot in your sope. That is what helps your ingredients not fall off when eating. 3. Heat the vegetable oil in a cast iron skillet, at least a 10 inch pan. You want the oil to come up the sides about 1/2 inch, but no more. So you may need more or less oil than a 1/2 cup. It took about 4 minutes for my oil to be hot enough to fry. 4. Gently place disc into the oil, cook for 3 to 4 minutes on each side, or until golden brown. I used a 12 inch cast iron skillet, so I could fit 3 sope at a time. Just be careful not to crowd the pan too much, this lowers the temp of the oil and your sopes will not cook properly. 5. Place finished sopes on a plate lined with paper towels and cover with a tea towel or paper towel. Keep at room temperature until you are ready to serve or serve immediately. 6. Store in an air tight container if you are using the next day. Refrigerate for up to a week. Reheat on a dry comal, cast iron pan, or in a toaster over on low. Place sope on plate. Add beans with a little juice, not too much. Follow with the meat, pico de gallo, Mexican crema, lettuce, and cheese. Pick up with your hands, insert in mouth, do not attempt to use a fork, it will not taste the same, trust me. That is great! Thank you so much, I am happy you like them!